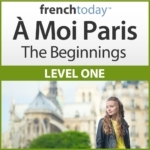 Home > French Blog > How To Learn French > Why Learn French with Audio and Not Just Books ? Why Learn French with Audio and Not Just Books ? After spending months learning French from the usual books you finally travel to France, and there surprise! The French people you are talking to can’t understand you. Your French sentences are correct, your French pronunciation seems right… what’s happening? The problem with learning French from books is that spoken French – French everybody uses everyday is very different from the “academic French” you’ll find in books. Your French language skills could be book perfect, you will have a hard time on the street, talking to perfectly “normal” French people. Watch out: when I say “the street”, I’m not talking about slang French, or “gangsta” French… Just the modern French language everybody uses nowadays – well, maybe not 70 years old politicians on TV, but all the rest of us in everyday situations. Of course, if your goal in learning French is just to read and analyse French Literature or pass written tests, then learning French from books will be sufficient. Most adults, however, learn French to be able to vacation in Francophone countries and be able to interact with people. In this case, you need to learn today’s French and, especially, hear “real” spoken French pronunciation. A perfect example of the difference between spoken French today and in books is the phrase: “Il n’y a pas de quoi”. This is why you need to hear, not just reading, everything you are studying is key to bring your French pronunciation and listening skills up to par with native “street” French. There is a lot of audio material out there, and it is important you spend time selecting the one that is right for you. This is particularly important if you are a beginner or intermediate since the audio material you work with should be challenging, yet reachable and give you a sense of accomplishment. It is very important as you are building your knowledge in the language that you also build your self confidence in it. I wrote a whole article about finding out your French level and right audiobook to study, I suggest you read it. I am of course bias to my own material that I designed specifically for that purpose. Check out my reachable French audio books and easy French novels. Learning French can be very rewarding and a great skill in your arsenal but you have to make sure that the French you learn can be used on your next trip to Paris, otherwise ,you will get discouraged very quickly with your French language endeavors. Here are my tips on the best way to study French for listening and understanding. How to best learn French for speaking. And finally how to pick the very best learning method – and avoid scams.